We are eagerly awaiting any and all progress! Glad to hear you're following along. I really don't have anything to show today. Maybe tomorrow if I can get it together. 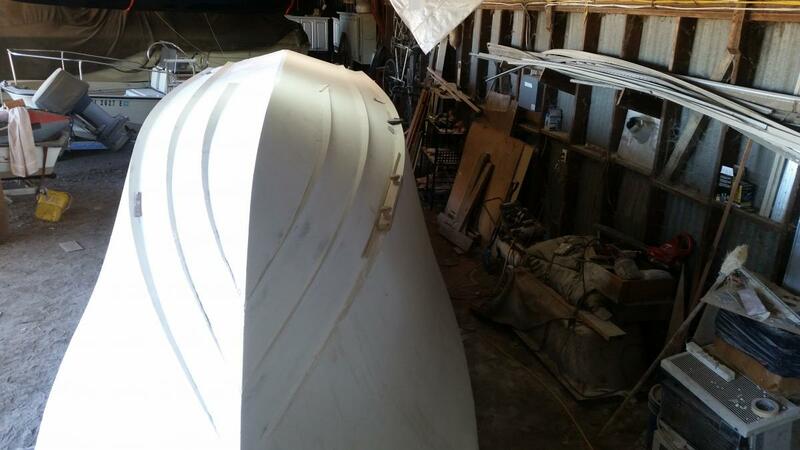 I have finished fairing (shaped, no highbuild/primer yet) the topsides and have moved on to lifting strakes and bottom work. But I have been distracted by nonproductive activities. Have you ever had a day where you just should have stayed in bed? I've had two weeks of that. 40 odd years worth of those days, but I'm too dumb to learn. Keep on keeping on, brother. Your are almost done with the horrible stuff. Can google please fix google photos? Why not just post pictures to this site? I understand that those who keep a photo essay of their build somewhere else choose to link to it instead of posting them again here, but the function here allows you to place the photos into your reply spaced out with the comments that pertain to each one and makes for a really nice over all comment. The people here are the ones who actually want to see all the gory details anyway. I've removed this post because of confusion it caused. Why not just post pictures to this site? Thanks for the advise, ended up doing this. Better for long term maintenance I suppose. 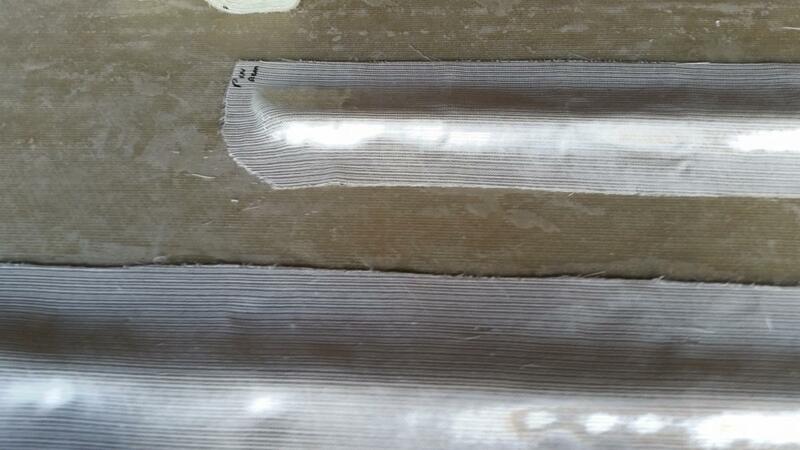 Hadn't been a lot to show just glassing, shaping, sanding and filling, 3 rounds of fill I think. 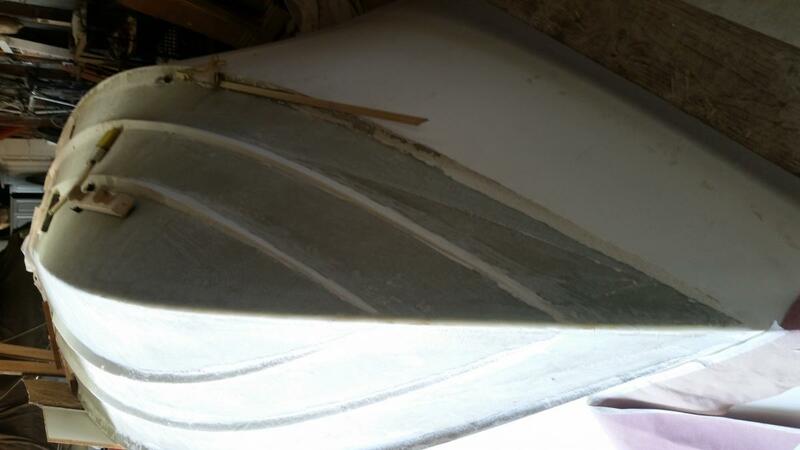 While difficult to tell from the photos, the outer strake is parallel to the keel in the after portion not the chine. smc, WHAT language are you speaking there???? Anyway, I enjoy following your build with the pictures----however ya get em on here. Englisch , soweit ich weiß , mit Ausnahme von ein Wort Deutsch . während ein Seitenhieb auf ihre matschig liberalen metality nehmen . Just read this. Not sure he's a mushy liberal, just trying to be funny. Some of us older folks don't speak too much computer. How google is run not chick. Oh, Google is crazy. I totally follow you. And Chick. I had no idea what you meant in your rant. Stupid German grandparents made me learn their language, though, und ich habe es nicht vergessen. Chick, by the by, is awesome. Me? Kind of doofy. Okay. Let's clear the air. I thought Steve meant Chick, but he meant Google. I believe we can all agree Google is not all it could be. Chick you may be mushy. I am definitely mushy in the head, strong in the body, and I have no idea what political thing I am. Humanist? I like the people. In summation: I'm dumb, humor translates poorly on the computer, and Steve is building a cool boat Google is making it hard for him to share. And, really, I think we are all cool enough here. Nobody says offensive things or takes offense too easily, I don't think. This forum is like a unicorn. I am amazed, honestly, at the high caliber of people on this board. Maybe I don't really belong here? I'm sorry for any worries I caused with my rusty German. Especially to you, Steve. Lots of square edges, I have been looking forward to this day for quite a while. Next up I need to ease all those edges and begin spraying alexseal 302 and sanding a bit more. Unfortunately, I'm busy with other things for the next couple of weeks so there she will sit. Here's an overview of the status today. Wow! You should be proud. That looks great! Thanks Robert, twice as long as I thought it would take. 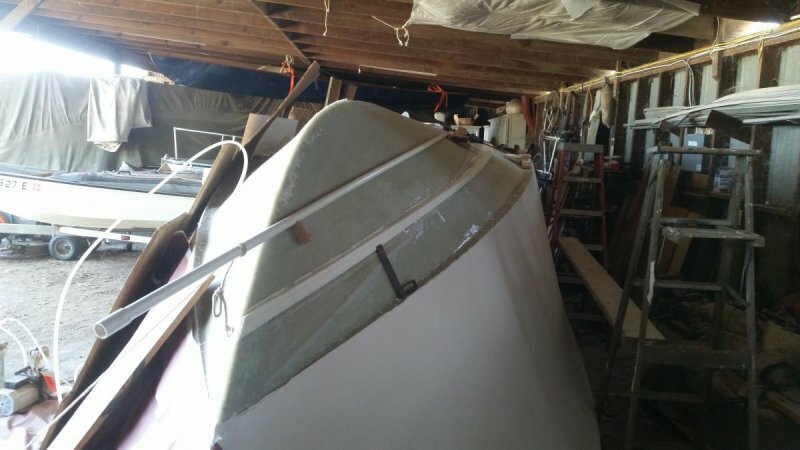 Building a boat is the slowest, dumbest way to get a boat. It's also the best. Think of the time away as a recharge. Imagine how excited you will be when you get back at it. Meanwhile, sneak in there and look every now and again. You did that. Good work. Got back to the construction this week with more sanding. 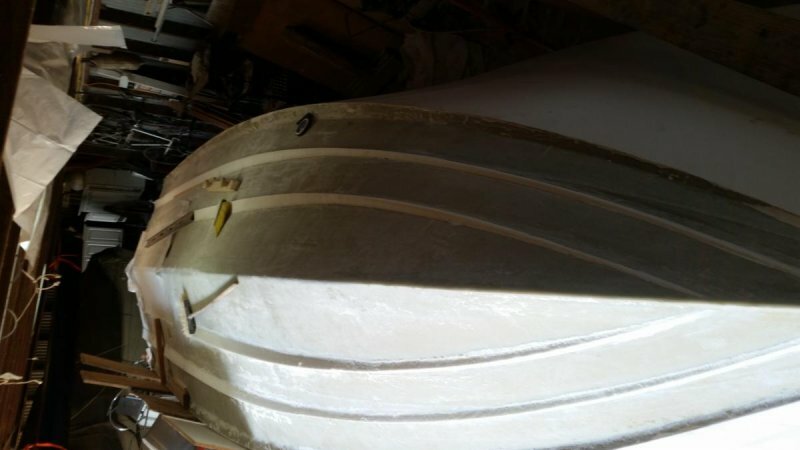 Knocked all those nice sharp corners off, boarded the entire hull with 80 grit, sanded all those inside radii. 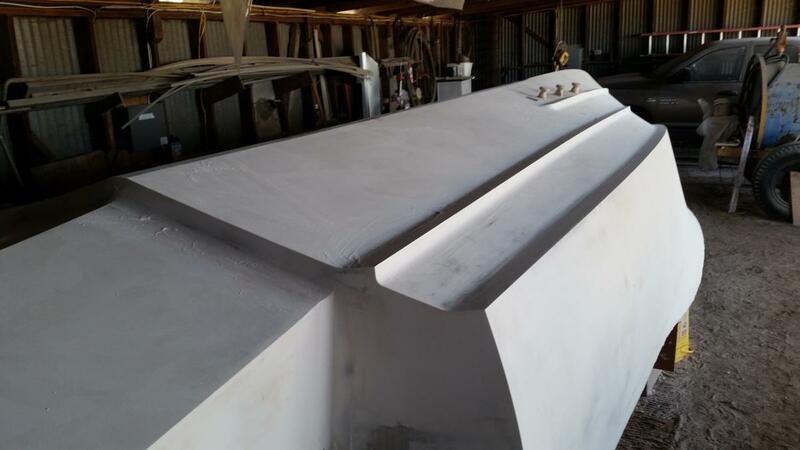 Got to thinking about shooting high build primer when the thought came to me, "why shoot high build on the bottom, it's straight and ready. Maybe just shoot sealer and top coat. Well I'm so glad I didn't. When I started shooting high build the contrast and shinier surface highlighted so many imperfections in my "ready for paint" surface, I was horrified. Boarded one half of the bottom today, looking much better. Should have it top coated by... well some time. 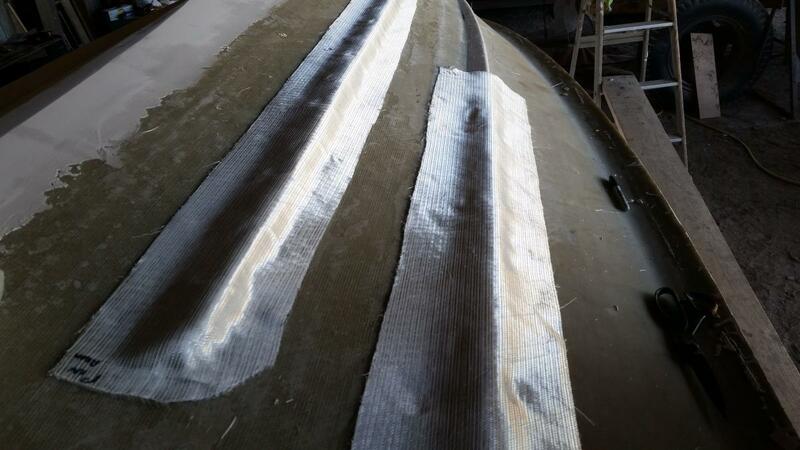 Panel seams always need some fairing, so unless it's an 8' boat . . .
For every single hour of topcoat painting time, expect a minimum of 10 hours of surface prep (fairing, smoothing, primer blocking, etc.). Don't see ads and make messing-about.com possible! Become a Supporting Member - only $12 for the next year. Pay by PayPal or credit card.